Equestrian Paradise Ranch and Cattle Company offers professional quality care for your horses. We welcome all breeds and disciplines. Here at the farm, we are a down to earth facility that enjoys having fun. We strive to make you feel as if you are at your own barn. Our main goal is the safety and welfare of your horse, so you can have peace of mind that your horse is well cared for. Wayne has over 50 years experience in the horse industry. 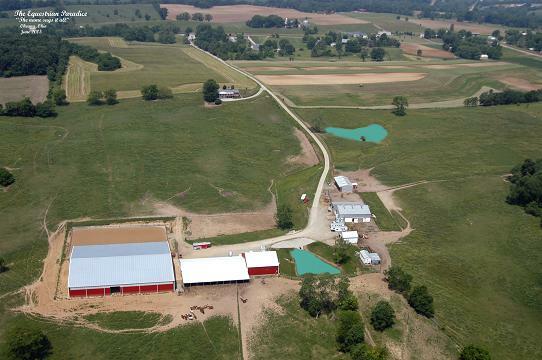 As a child, Wayne assisted his father with the family owned horse farm. This consisted of evaluating horses to be used at Fort Scott Summer Camp, Camp Firefly and Camp Kern for ages 7-17. At the age of 27, Wayne bought his first farm where he bought and sold quality riding horses. In 1997 he purchased a 40 acre horse farm which he renovated into a successful, high quality boarding stable. The opportunity to purchase the family farm, now known as Equestrian Paradise Ranch and Cattle Company, became available in 2001. Stacey is a fun loving jeweler, turned horsewoman from Indiana. She and Wayne crossed paths in Nashville, IN, and it was a perfect match. Stacey became a permenant member of the family in 2010. Being born and raised around horses and horse people, Wayne has seen big changes in the needs of both. These needs are what we strive to provide at our facility.